Beet root : 2 nos. Soak thur dal for 10 to 15 min. in water. Take it into a pan, add 2 to 3 cups of water and boil for around 10 min. in a medium flame until it is half cooked. 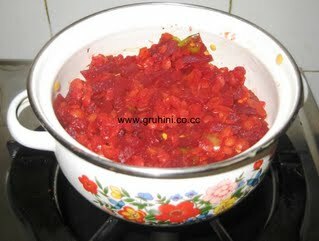 To it add chopped beet root, onion, green chillies, red chilly powder, Dhaniya powder, haldi and salt. Close the lid and cook for 10 to 12 min. in low flame until the beet root is cooked. Heat Ghee in a pan, add Rai, jeera and uraddal. When rai splutters add mashed garlic flakes, red chillies and curry leaves. Add the thadka to the curry. Take it into a serving bowl and garnish with fresh coriander leaves. You can also add grated coconut for more taste. 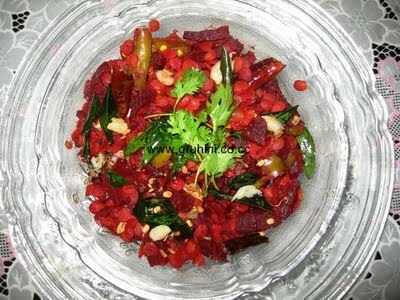 Beetroot-dal curry is ready...........Serve hot with rotis or steamed rice.